Who are K. McGuinness Opticians? K. McGuinness Opticians has been established for over 30 years and has two practices in Washington and Newton Aycliffe. 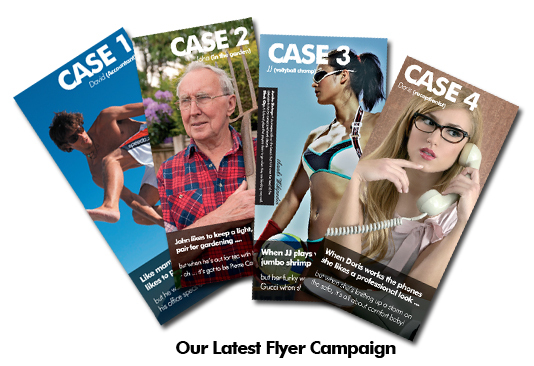 K. McGuinness Opticians wanted an ongoing marketing campaign which included flyers for leaflet drops, advertisements in the local press and internal point-of-sale material including posters and stickers. They also needed a well optimised website and a coherent brand to run across the whole marketing effort. We created a tagline 'Treat Your Eyes to K. McGuinness Opticians' which has run across all the promotional media we have produced. 'Treat Your Eyes' was a simple way to communicate the message that going to the opticians is more than just a regular purchase. It's something existing and potential customers should value highly and treat themselves to the best. John McGuinness was kind enough to write a testimonial - Find out more what John McGuinness thought of our Full Service Agency Approach. K. McGuiness Opticians send out letters to their customers telling them their appointment is due. We have designed and printed all sorts of promotional flyers to go alongside these letters to help improve the return rate of existing customers. The website we designed for McGuinness Opticians has reached the dizzy heights of No 1 in a search for 'Opticians Washington' and No 1 in a Google search for 'Opticians Newton Aycliffe'. Not bad for an opticians with 2 practices (one based in Washington and one based in Newton Aycliffe!). We also developed an online appointment booking system where users can request specific appointment times.